Few 19th-century pipe organs built in the United States have survived the American urge to demolish and rebuild. The organ at Pilgrim Congregational UCC in Tremont is one of the survivors and it is a gem. The restored organ speaks with the character and integrity of a noble instrument that has withstood the ravages of time. It serves the music of its period with an authentic voice, and it restores a missing piece to the city’s musical resources. Mr. and Mrs. Charles F. Olney purchased the Pilgrim organ in 1894 in loving memory of Thomas Lamson, the noted industrialist. It served as a model for the early organ in the Christian Science Temple in Boston. 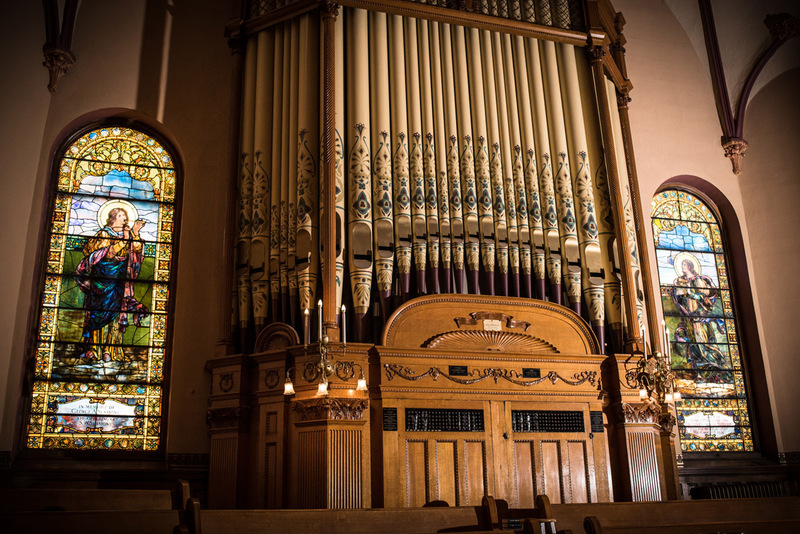 The classic pipe work came from the Roosevelt Organ Company in New York. In 1893, the same year Pilgrim moved into its current building, the Votey Company of Detroit bought The Roosevelt Company. Many fine Roosevelt employees and patents went to the new firm at the time of the merger. In 1899, the Votey Organ Company merged with the Aeolian Company, which eventually became know as the Aeolian-Skinner Company. In 1936, the Pilgrim organ was renovated and a new console was added by the M.P. Moeller Company. Two “organ repairmen” who long-time Pilgrim members remember as “the two firemen” did further restoration in 1968. In the September 1994 issue of The American Organist, Chris Holtkamp referred to these men as “incompetent and unscrupulous charlatans masquerading as organ builders.” According to Chick Holtkamp, “they took a chain saw to the original Farrand and Votey manual chests to open the way for their installation of electric magnets.” The once-proud Pilgrim organ then fell silent for over twenty years. The Holtkamp Organ Company was chosen for the renovation. Chick Holtkamp’s grandfather was a member of Pilgrim Church, and Chick found great satisfaction in restoring life to the organ his grandfather listened to when he was a boy. Chick was inspired by founding members of Pilgrim Church—industrialists who believed that the future lay in electric power—who selected Farrand and Votey for its use of electricity for the organ’s action. The cost and uncertainty of restoring the original manual wind chests led Holtkamp to use new slider chests with electric pull-downs. The original builders had placed the Great and the Choir inside one large, deep expression box. Holtkamp moved the expression shades to the back of the case to enclose only the Choir division. The Great organ is now unenclosed, allowing for a more cohesive blend between the Great and Pedal divisions. In 1936, when Moeller replaced the console, they eliminated all the 4-foot stops and extended them downward to make them 8-foot stops. We believed that restoring the 4-foot stops made the organ brighter, better balanced, and more versatile. The original 4-foot Octave and the Great mixture were missing many pipes, so Holtkamp rebuilt those stops to blend with existing pipework. They chose a relatively low mixture beginning at 2’, 1-1/3’, and 1’. A fourth rank was added in the tenor octave for extra brilliance. Holtkamp’s goal was to ensure a smooth development of the principal chorus to enhance the fullness and warmth of the instrument. Because of the many years of the organ’s silence, every step taken was a step in faith, as we had no idea how the renovated organ would eventually sound. In a 1950s renovation of the sanctuary intended to soft-pedal the Victorian style of the church, the originally gold-leafed façade pipes were painted over in a drab olive gray. Under the guidance of Victorian restoration specialist Dale Smith, 60 Pilgrim people took the pipes to the theater behind the balcony. Under Dale’s watchful eye, we stenciled and hand-painted the pipes to restore them to their original splendor. Before they were put back in place, we signed the backs of the pipes with magic markers. “Peace and joy to future generations of Pilgrim Church,” Pilgrim member Susan Sanders wrote, as we bequeathed the instrument to future music ministry. The statue of the Angel Gabriel was found lying on its side in a dark storage room. Dale re-gilded the statue, and found a cast-off horn on the steps of The Cleveland Music School Settlement for Gabriel to blow. Gabriel now presides over worship from the top of the organ case. We believe Gabriel smiles when the organ plays and Pilgrim people sing. It was a thrilling experience to be part of a tonal reconstruction that simultaneously restored the visual beauty of the original instrument in our majestically alive, beloved sanctuary. Future plans for the organ will include a necessary replacement of the console with a state-of-the-art digital console, which will help eliminate the quirky things that sometimes happen—pipes that speak one minute but not the next, and pistons that are not entirely reliable. We know of two Farrand&Votey organs still in service. Both maintain the original stop lists with added digital enhancements. We would like to eventually have a pedal division that adds brightness and clarity, not just weight, and would like to have larger-scale reeds to lead hymn singing and give the instrument a bit more “warm bite.” At Pilgrim Church, we are appreciated and celebrated no matter who we are, or where we are on life’s journey! We have a similar respect for the uniqueness of our organ. We want our organ to always be what it was and what it is, to have it stand as an artifact of organ building from a previous century. People who play this instrument report feeling a spiritual connection to a century of organists, who sat on the same bench, coaxed the same keys into life, and stirred hearts with the same combination of stops and sonorities. We strongly feel the presence of the Saints of Pilgrim Church who went before us, knowing that this great cloud of witnesses was led in song and praise by the same sounds that continue to inspire the people of Pilgrim Church in this new day. Soli Dei Gloria! Photo of the organ by Michael Armstrong.